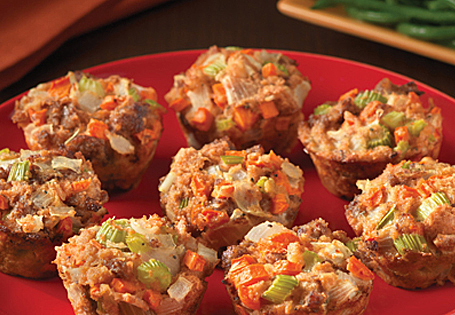 Stuffing in a muffin form! Preheat oven to 400°. Lightly spray a 12-cup muffin pan with non-stick spray. In a large sauté pan, brown and crumble Italian sausage over medium-high heat, about 10 minutes. Remove sausage and set aside, add vegetable oil. Reduce heat to medium; add onion, carrots and celery. Sauté until vegetables are clear and soft. Add chicken broth and bring to a boil, reduce heat and simmer for 10 minutes. Transfer vegetables to a large bowl to cool. Add black pepper, salt, and Italian seasoning. Taste, adjust seasoning if necessary. Toast diced rolls on a baking sheet until crisp, about 10 minutes. Add rolls, Italian sausage and beaten eggs to the vegetable mixture, stir to combine. Place 1/2 cup of roll mixture into each muffin tin. Bake for 30 minutes, until toothpick comes out clean and dressing cups are lightly browned. Serve with your favorite gravy and enjoy!